“So I began to think about Gehry and his ideas of form and beauty as it pertains to space. The ideas behind his aesthetics are unmatched, but the functionality of his builds in RL are somewhat unsuccessful. Therefore, in no other place do Gehrys designs belong more, than in Second Life. I first began to think about creating a Gehry Inspried design when I was looking for a challenge. Using geometries in Second Life to create an organic shape is not an easy task. So upon laying out the structure for the build, I decided to keep the general spaces of the building open for use, since I had no purpose for it yet. The building indeed was a challenge, but I feel that it is a success. It is both imperfect in form, and staggering in scale. It is a pure expression of architectural exploration. The opening for the build will be December 6th at 5:30 PM SLT. I will give a brief 5-10 minute presentation, then everyone can walk through the build. A slideshow of screenshots is HERE. ‘The Tracer,’ also known as Ted Mikulski in real life, presented his Thesis Presentation for his Architectural Master’s Degree at Norwich University in Vermont this morning. A pre-recorded version of his thesis presentation was played in-world, mirroring his live presentation to the real-life jury. Bravo! I think this presentation marks the continuation of a new generation of architectural presentation. In the future, I think we will see the architectural education begin to embrace and integrate virtual worlds into everyday studio life. Early adopters like Ted and Tab Scott are ahead of their time and leading the way to more widespread academic adoption. Instead of pinning pieces of paper onto a wall in front of a jury, and trying to explain a design concept, why not invite them into an immersive environment where they can actually experience it? Jurors and students alike could take the virtual model and help it evolve through real-time suggestions made by actually transforming the design and really helping the student learn about architecture through immersive experience. 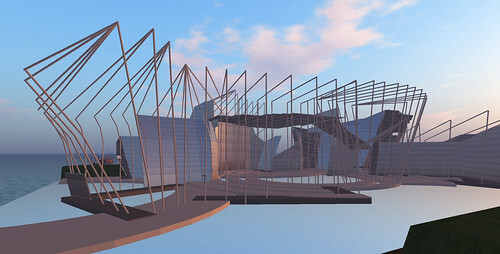 Moreover, the entire studio could take place in Second Life, with study models evolving throughout the semester, within virtual representation of the site’s actual real life context. Members of the community might actually stop by to provide feedback. But the best part is, advisers and faculty are no longer limited to those located near the physical university. Any professor or architect from anywhere in the world could now gain direct access to the students and their design concepts for real-time critique. First year students could sit down and cam into the design development of a grad student’s virtual lab space, watching how they think about the design – how they test various ideas – and literally watch the building unfold. To a certain degree this is possible in a real life setting, but a group of say 15 Arch 101 students sitting in the same room hunched over a grad student’s shoulder watching them cut basswood is quite a bit different than having their invisible cameras huddled around the designer’s actual thought process, watching it unfold in real time. In the near future, the design evolution could even be recorded. As the presentation begins, the student plays the development animation, showing the jury where they started, and what they went through to arrive at the current design – pressing pause at certain key-frames to explain it. The whole process could really become non-linear, asynchronous – enabling faculty to be present in the studio, no matter where (or when) their physical bodies happen to be located. If a student’s design has changed for the worse, they can literally rewind to an earlier dimension and continue building from there. Perhaps a studio project starts as a collaborative exercise, enabling students to collectively co-create a 3D representation of the project statement. The Wikitecture process could become an integral and potentially very powerful aspect of architectural education. At some point, the co-created project freezes, and each student ‘forks’ into a final design solution having started at a common base point. Depending on your stance on the feasibility of Wikitecture, some might even argue that entire courses (or a new department altogether) ought to be dedicated to it, given that it will (in my opinion) become one of the ways architecture is professionally practiced on in the relatively near future. In sum, today’s presentation marks the continuation of a vector toward a significantly different mode of architectural education. In this case, the jury still had the luxury of a back seat vantage point, watching the presenter walk around inside the virtual model. But maybe next time, the jury will have to actually occupy the space and experience it firsthand? This time, the virtual audience in attendance, which represented a a tremendously qualified, geographically diverse group, was not able to participate in the real-world presentation. But maybe next time, there could be a 2-way portal between the two worlds to facilitate a more interactive and virtual dynamic. I think Ted’s presentation raises the bar for architectural presentation in Second Life, and invites a new generation of virtual-savvy students to start using this environment in their own academic environment. Well done Ted! Keep up the great work! Learn more @ www.theSLSA.com. See a slideshow of images HERE.